The Silverstone circuit has been part of the F1 schedule since the World Championship began - it hosted the very first official race in 1950. Since then, the track has undergone many changes, the most recent being upgrades to the pit and paddock complex, and tweaking the final sector of the circuit. Memorable sections still exist though, with Maggots & Becketts, plus the Hangar Straight. 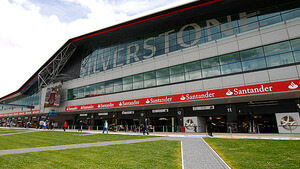 Rain is often a factor at Silverstone, ramping up the racing action. 16/08/2011 The 2014 engine regulations - do we have anything to fear? The W08 has been out doing some early laps around a very windy Silverstone circuit.